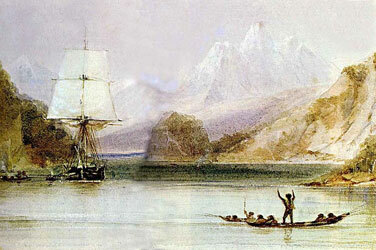 Much attention has been paid to the British Navy's explorations of the Tierra del Fuego region under commanders Philip Parker King and Robert Fitz-Roy, and to the illustrious naturalist Charles Darwin, a passenger for several years in H. M. S. Beagle. Given the authoritativeness of their reports, there was probably little reason to be concerned with personal narratives, such as the one published by John Macdouall, the Beagle's clerk during the years 1826 and 1827. Overshadowed the author may have been, but Macdouall's book has endured. With the perspective of time, his observations and descriptions of events have acquired a level of interest that merits closer attention. His writing style has a tendency to be light-hearted, at times almost gossipy; and it is written from the viewpoint of an observer, rather than the high command. His comments are less guarded, and (one imagines) closer to reality. He tells of individual foibles and misfortunes, but there is no criticism, only observations on human nature. Macdouall excels in telling about people, whether naval comrades or unfamiliar locals. Also woven into his story are careful descriptions of scenery, coasts and sailing difficulties; plus vegetation and wildlife seen on his foot excursions. At San Gregorio, on the Magellan Strait, the Aónikenk were eager to barter their guanaco skins for the strangers' tobacco, ship's biscuit and alcohol. Moving around the beach and their encampment, Macdouall describes their horse gear (spurs and saddles) and bolas, and mentions their use of the lasso. More uncommon are his descriptions of a burial site, and an apparently religious ceremony involving a figure know as a "cristo". Other human touches are the enthusiasm of an older woman to "show off" her grandchild, and the embarrasing curiosity of a group of young women to "explore" the author's person and belongings. In the western section of the Strait, there is more bartering, though the goods-poverty of the canoe people meant that trade was mostly one-way. Here he experiences a momentary fear of cannibalism. Additional (second-hand) accounts include contacts with other Kawéskar families, and the potentially dangerous shipwreck of Captain Brisbane on the Fury Islets, where the survivors had begun to fear for their lives at the hands of increasingly aggressive locals.